A review of Biparan Kii Riit Ton Sach Daa Maarag by Gurbakhsh Singh Kala Afghana. An earlier version of this review was published in the February 2003 issue of The Sikh Bulletin. In a selfish way, I am grateful to Joginder Singh Vedanti, jathedar (high priest) of Akal Takht, Sikhism's highest temporal authority, for banning further publication of Gurbakhsh Singh Kala Afghana's writings. You might think, "That's an odd way to go about defending Kala Afghana's civil liberties!" Indeed, it is. Read on to see what I mean. Like all forms of censorship, Vedanti's move against Kala Afghana deserves categorical condemnation. What I am thankful for, however, is the predictable response to the jathedar's remiss attempt to stifle freedom of expression, i.e. the catapulting of Kala Afghana's writings to international public attention. I, and perhaps many others, would likely not have read Kala Afghana's writings had it not been for the Sikh clergy's misdirected zeal. Kala Afghana's writings are in Gurmukhi, a Punjabi script with which only a small fraction of today's Sikhs can claim reasonable fluency. However, the high-handed embargo has driven me to read Kala Afghana's works and translate relevant portions to English for sharing them with a wider audience. Hardev Singh Shergill, publisher of The Sikh Bulletin, a monthly newsletter published from Roseville, California, is a poster child for the growing cynicism and anti-establishment sentiment amongst Sikhs who feel that their self-serving leaders have consistently let them down. Shergill told The Sikh Times that his foray into publishing was a rejoinder to the callous indifference exhibited by the Sikh clergy and political leadership alike in response to his swindling (The Week, Oct. 25, 1998) at the hands of the self-styled 'Guru,' Amar Singh Barundi. The introduction on the back cover of 100 Banned Books by Nicholas J. Karolides et al laments, "Throughout history, tyrants, totalitarian states, church institutions and democratic governments alike have banned books that challenged their assumptions or questioned their authority." It goes on to say, "Even today, attempts by school boards, local governments, and religious fanatics continue to restrict our freedom to read." However, Margaret Bald's comment in the same book carries eternal hope, "When you look back over centuries at censorship and see the incredible range of books and authors whose works were suppressed, you can only be struck by how absurdly ineffective and useless it has been in the long run." No freedom-loving person can possibly condone the Akal Takht's boycott of Kala Afghana's writings. Therefore, while the quality of Kala Afghana's scholarship should not determine his freedom to publish, it seems fair to ask, "Is there a coherent central message in what he writes?" (Bhai) Dr. Harbans Lal, who needs no introduction, commented thus during a recent conversation with The Sikh Times. He said, and I paraphrase, "I haven't read Kala Afghana's works in detail and am, therefore, not familiar with the precise issues. However, Kala Afghana's essential message is a laudable one." Lal added, "Kala Afghana says that since the Adi Granth [also known as the Guru Granth Sahib] is the absolute and irrefutable source of Sikh theology, anything that contradicts it should not be awarded the status of Sikh scripture. I agree that the Adi Granth is supreme and cannot be repudiated." Most scholars seem to agree that Guru Gobind Singh was only responsible for a fraction of the Dasam Granth's contents. 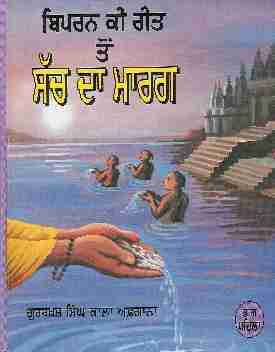 It is on this basis that Kala Afghana questions the elevation of the Dasam Granth to the level of Sikh scripture. Consequently, he objects to the traditional use of bani (verses) from the Dasam Granth during Khalsa initiation rites. In Sikhism, W. Hew McLeod, one of the foremost scholars on Sikhism, writes, "Today, however, [the Dasam Granth] does not rank with the Adi Granth, although the works the Panth [Sikh community] universally attributes to Guru Gobind Singh are selectively promoted to this level. The other works in the Dasam Granth are little read and the greater part of the work is largely ignored." Commenting on the Tria Charitra (also known as Pakhiyan Charitra) contained within the Dasam Granth, Pritpal Singh Bindra, the award-winning author of Thus Sayeth Gurbani, who has extensively studied the Dasam Granth, states that many of the contents are "absolutely pornographic." He writes, "[To] insist that the hikayaat [stories] are the work of Guru Gobind Singh is tantamount to questioning [his] knowledge, wisdom and philosophy." McLeod expounds, "The Tria Charitra are cautionary tales of the wiles of women, and in several cases their inclusion in a sacred scripture is somewhat difficult to justify. They were, however, very popular among their originators and occupy 580 pages [of a total of 1,428 pages] in the printed edition." McLeod goes on to note, "Only the Nihangs, the blue-garmented, steel-bedecked remnant of the eighteenth-century Khalsa, still give it a place of honour in their gurdwaras." Whether or not the above constitutes a meritorious central thesis, it is indeed distressing that both the supporters and the detractors of Kala Afghana hurl grave accusations at each other, including charges of treason against the Panth and agency with Hindu organizations and the Indian government. Advocate Gurcharanjit Singh Lamba's rebuttal (The Original in Gurmukhi, An English Transliteration) to Kala Afghana's writings is an example of the widely held traditionalist view that equates challenges to tradition with a betrayal of the Panth. It would seem that Sikhs are able to neither challenge nor defend traditional thinking without risking the stigma of labels that all and sundry seem qualified to dole out. Either the Indian intelligence folks are much more resourceful than anyone ever gave them credit for or Sikhs are simply unable to gracefully handle diverse schools of thought on religious matters. Clearly, it is for scholars, and not the Panth, to determine the authorship and content of the Dasam Granth. Equally, the Panth, and not scholars, must decide whether or not to accord the Dasam Granth the status of Sikh scripture at a level equal to the Adi Granth. However, I can state, without any hesitation, that the Panth will be the loser if it allows the Sikh clergy to suppress its right to freedom of expression.